My name is Morty, and I admit it...I am the muse for my author. She has so much fun writing me because she has no idea what I will do next. I love surprising her. I'm very mysterious, you see. No one really knows just exactly what I am, and I like to keep it that way. Trouble in the Tarot doesn't come out until March 5th, but it is up for pre-order now. Looking at this cover, I remember that day well. 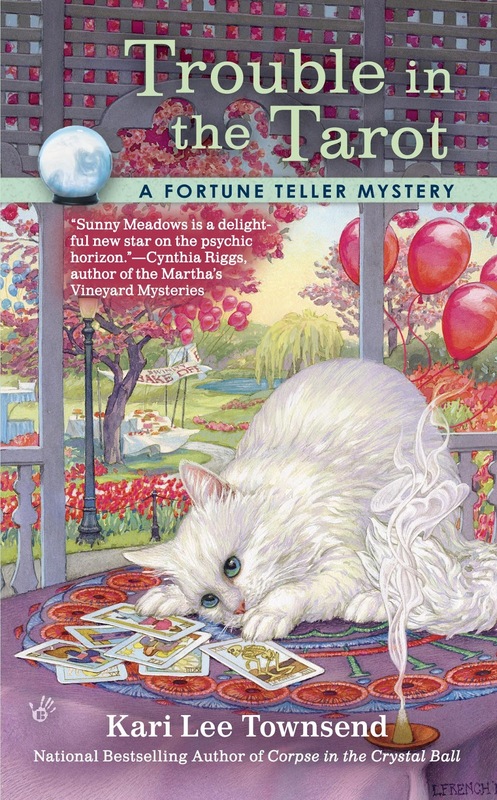 Granny Gert talked Sunny into reading tarot cards at the annual Summer Solstice Carnival. We set up shop under the Gazebo and everything was going well until Granny's arch nemesis Fiona showed up. Then all sorts of trouble started brewing. The trouble those two got into made my fur stand on end. And my poor housemate, Sunny, nearly had a nervous breakdown. 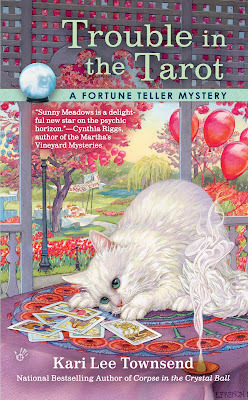 Especially after a dead body was found and of course Granny and Fiona are the prime suspects. Trust me, you'll want to read the book to find out what happens next. Meanwhile, I'm going into hiding for some much needed rest...until I can think of more mischief to stir up in my author's mind. Morty, I can tell by your expression that Mischief is your middle name! I can't wait to read this one. How are things between Sunny and Grumpy Pants? Heating up as always, Dru :-) Loving writing this series. Morty is the Poirot of Cats, the Sherlock of kittydom. I can't wait to hold a copy of this book in my hot little hands. Kari, you are a gifted author and we all love you. Looking forward to March now! I enjoy your series and Morty is divine intervention in these mysteries. . I am pulling for Sunny to be accepted in her new town for who she is and love the addition of the house and its history in your stories. Well done! I love this cover! Looking forward to the book, Kari and Morty! Awww thanks Nora :-) You rock! And Lexie, that's so sweet. I love the house as well. I'm having so much fun with this series.